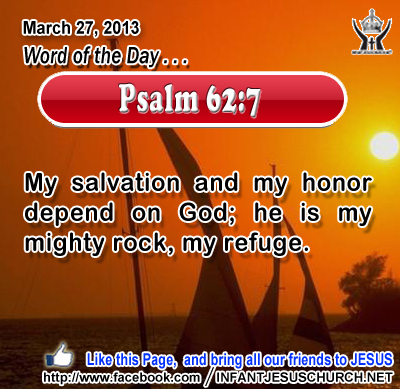 Psalm 62:7: My salvation and my honor depend on God; he is my mighty rock, my refuge. Heavenly Father, fortress of our life, we place ourselves in your care. Take charge of our future and use us for your glory. In you we take refuge and on your strength we rely to make our days worthwhile. In the precious name of Infant Jesus we pray. Amen. 14Then one of the twelve, who was called Judas Iscariot, went to the chief priests 15 and said, "What will you give me if I deliver him to you?" And they paid him thirty pieces of silver. 16 And from that moment he sought an opportunity to betray him. 17 Now on the first day of Unleavened Bread the disciples came to Jesus, saying, "Where will you have us prepare for you to eat the Passover?" 18 He said, "Go into the city to a certain one, and say to him, `The Teacher says, My time is at hand; I will keep the Passover at your house with my disciples.'" 19 And the disciples did as Jesus had directed them, and they prepared the Passover. 20 When it was evening, he sat at table with the twelve disciples; 21 and as they were eating, he said, "Truly, I say to you, one of you will betray me." 22 And they were very sorrowful, and began to say to him one after another, "Is it I, Lord?" 23 He answered, "He who has dipped his hand in the dish with me, will betray me. 24 The Son of man goes as it is written of him, but woe to that man by whom the Son of man is betrayed! It would have been better for that man if he had not been born." 25 Judas, who betrayed him, said, "Is it I, Master?" He said to him, "You have said so." The number of coins Jewish Priests gave Judas was equivalent to the number of years the Savior had sojourned in this world. For at the age of thirty, he was baptized and started to preach the gospel, like Joseph was thirty years old when he began to gather grain for his brother. Jesus knew earlier what would befall him. As Jesus ate the Passover meal with his twelve apostles he put them under examination and suspicion to teach them to examine themselves rightly, lest they be high-minded and think themselves stronger than they were. We also must look at ourselves in the light of God's truth and grace and ask him to strengthen us in faith, hope, and love that we may not fail him or abandon him when we are tempted. Do we pray with confidence in the words Jesus gave us to pray: Do not lead us into temptation, but deliver us from evil? Heavenly Father, we are exceedingly frail and indisposed to every virtuous and gallant undertaking. Strengthen our weakness, we beseech you, that we may do valiantly in this spiritual war; help us against our own negligence and cowardice, and defend us from the treachery of our unfaithful hearts; for Jesus Christ's sake.